Forget the news out of Washington on distant locals. The real news is using satellite for rural broadband. Last month, EchoStar submitted a bid for U.S. rural broadband stimulus funding in partnership with WildBlue, with which it already has a distribution agreement (AW&ST Sept. 14, p. 33). The teaming arrangement, dubbed EchoBlue Rural Broadband, is seeking $130 million in grants from the National Telecommunications and Information Administration (NTIA) and $400 million in loans from the Agriculture Dept.’s Rural Utility Service to help cover the estimated $500 million needed to build and launch a high-data-rate Ka-band satellite. In addition, EchoStar requested $100 million in stimulus funding to launch broadband service with its existing satellites and another $30 million or so to fund customer hardware. The company is also rolling out an IPTV service, known as VIP-TV, at its 85 deg. W. Long. orbital location that it sees as a possible new “killer application” for the telecom satellite sector. The service offers an MPEG-4 encoded IP stream of about 275 standard and high-definition TV channels, and is aimed at second- and third-tier U.S. cable and telecom operators. EchoStar CEO Dean Olmstead admits it will be a challenge to make the VIP-TV business case work. SES Americom (now part of SES World Skies) abandoned a similar offering, IP-Prime, citing high costs and insufficient revenues. However, Olmstead, a former Americom chief executive, thinks EchoStar can avoid the pitfalls of the SES service, which was burdened by heavy technical support for the many small users that dominated its customer base. VIP-TV, he says, will be able to take advantage of EchoStar’s experience with set-top boxes to minimize risk. In March, EchoStar began offering a conversion service to lure IP-Prime customers. Go Dean O! Remember Americom2Home? That idea was proposed on his watch in 2002. 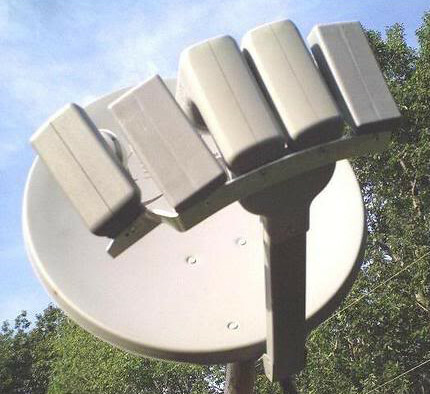 Since EchoStar’s Ka-band payload was launched, it wasn’t actually used for broadband connectivity — at least not on the same scale. Federal agencies (read: DoD) were consistently asking for capacity, and WildBlue turned to EchoStar to augment their inventory (some spot beams were sold-out quickly). If satellite is "quick to deploy" for Internet service, why have we waited years for satellite broadband to come around? Answer: profits. 80% EBITDA margins. This entry was posted on Monday, October 19th, 2009 at 10:50 am	and is filed under Astronomy. You can follow any responses to this entry through the RSS 2.0 feed. You can leave a response, or trackback from your own site.